Home Lifestyle	This is an Opinion Post. I’m going to share my opinion today. Something I don’t often do but today I’m going there. I’m going there because I am tired of being marginalized. And I am SICK and tired of being boxed in and grouped in with stereotypical caricatures. I think that any number of people on any given day feels the way I feel, depending on the issue. But today is my day. And in the interest of full-disclosure, I am white. I am female. I am not by American standards wealthy, but I am in the wealthiest 10% of people in the world. If you are against this decision, and that is what you REALLY believe about the opposing opinion, then I can’t see how anyone will ever bring change to the table. The Wake County School System as it stands needs serious help. It NEEDS CHANGE. Now, perhaps this isn’t the best way, but I think the fact that things are happening is a step in the right direction. Right now, my home is in a low-income neighborhood. We chose this neighborhood because it was affordable and diverse. The school we are zoned for however, is in an affluent neighborhood and only about 15 minutes away. The school right around the corner is one of the lowest rated in Wake County. 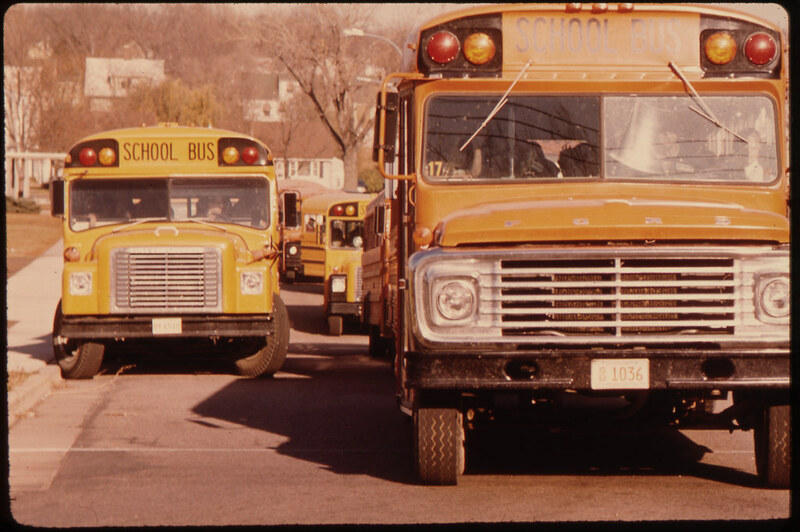 So you might ask, WHY then am I for the end to busing? And I would answer, because this is my community. I want to love it. I live here and if there is a part that is hurting, I want to help fix it. Not shrug my shoulders and send my child to a school in a better neighborhood. Many children would not be zoned for a school 15 minutes away but an hour or more. That is NOT acceptable! Children that are riding a bus for several hours each day are NOT reaping the benefits of a better education. They likely will not be able to participate in extra-curricular activities because of the bus schedules, will have LESS time to do homework and will be getting up earlier potentially getting less sleep than if they were able to attend a community school. The fact that they would be in a school with many different color faces and different sized pocketbooks does not seem like a good enough trade off to me. I concede that putting an end to busing is not the end all-be all solution to the problem. But it does not a racist make. As concerned parents, we need to let our actions be the guide to what we want for our children. Are we better people by living in gated communities and opening the doors of our schools to the less fortunate while still enjoying our affluence? Or maybe, just maybe, could we disperse into the communities of need and get involved? Could we meet people and love our neighbors instead of shipping them off to be someone else’s problem? If my son ends up in our neighborhood school when all is said and done, I want to love that school. Get involved and do my part. It is after all, my responsibility as his mother. If there are communities that need more help, then by all means LET US HELP THEM. To redirect the problem does not solve the brokenness. That requires personal, hands on involvement. And if you ask me, THAT is the conversation we should be having. Maybe you should share your opinion more often? Great post and I appreciate you vocalizing this. Amen, girl. I knew I liked you. You are spot on. My wife and I were excited when our children were going to be heading to North Ridge Elementary, then West Millbrook Middle, and then Millbrook High School in the 80's These schools are five minutes from our home. But year round schools started and the best teachers and many children jumped ship to Durant Elementary/Middle. This left North Ridge and West Millbrook to be back filled with low income students. It took a few years to recover from this along with WCPS experimenting with inclusion(mainstreaming trouble children in the classroom). And guess what the year round schools were basically white, it was segregation in another form. Then the charter schools started and more jumped ship and these schools were extremely segregated. So, good luck with your neighborhood school, it looks like you will have some help from the new school board to make it better than what we went through. My kids got a good education and ended up in the same colleges as the year round, charters, and magnets. Oh, and the funny thing that happened was that when high school came around all those parents that jumped ship years before came back to Millbrook HS since the number of year round, charter, and magnet high schools is few and far between. Very well said. I don't have a child who is in school yet, but I think you are totally entitled to voice your opinion, and that you have every right to be frustrated with those who think that if you don't think the way that they do then you don't think the right way. Did that make sense? Good for you for saying what's on your mind! i was a teacher, and i totally agree with everything you said. FURTHERMORE, just having people of different socio-economic statuses does not make a school diverse in all the ways that it needs to be, and wanting to go to a neighborhood school does not make a person a racist or mean they're in favor of segregation, as so many opponents would have us believe. Andrea, we do not live in Raleigh anymore but Will has always said we will return. With all the drama with the schools here in Charlotte, I have considering homeschooling Bryce from day 1. I do not want to run away but right now they keep moving the kids around in all of the new schools because of overcrowding and it is just ridiculous. The parents say their peace and the school board seems to ignore them. I have definitely always wanted to be a classroom mom but I want what is best for my child. It saddens me when he is only 2 and I worry about what will happen in 3 years! i could not agree with you more! So well said! You have some really good points. I especially agree that not everyone who is for neighborhood schools is a racist. The problem I have with the way the new school board is proceeding is that they are undoing what they perceive as a problem without having a solution in place. Unfortunately, most people are not as conscientious as you are. Also,it's not realistic to think that parents in poverty have the time or resources to get involved like you or I do. So I agree and disagree. What busing has become is not the best solution for all the children. However, a step backwards is rarely a step in the right direction. This is a great post, Andrea. You should share you opinion more often (and perhaps cross post it somewhere *wink wink*).